Black powder tumbled to the breech. Tamara tapped the brass measure against the muzzle of her chiefs-grade trade gun, the “Silver Cross,” as she always does, making sure every last granule of her modest turkey load made it down the bore. “Should I use one card or two?” she asked, turning to look at me. “Go with one, like you usually do,” I said as black powder flowed from my buffalo horn, some spilling over the sides of my tarnished adjustable measure. I dumped that charge in my own trade gun with a quick upsetting motion, then slipped the measure back in my shot pouch. I bent forward and grasped an appropriate amount of torn grass that lay piled at my feet. Standing up, I formed the dozen or so blades into a ball about the size of the death sphere. I sensed all eyes were on “Old Turkey Feathers” and the green, natural wad that I held in my right hand as my left hand slid the wiping stick from the smoothbore’s ribbed brass thimbles. Tom Lounsbury stepped close, peering into a small camera. “Hold it a minute, I’d like to get a shot of your grass,” he said with a wry smile that gave away his double entendre. I obliged with a broad grin and looked straight into the camera. Over his shoulder, to the right, Mark Cargill’s eyes were wide with disbelief. Tam stood with her wooden range rod tucked under her left arm as a charger full of #5 lead shot rattled down the tube of the Silver Cross. After seating the grass wadding firm on the powder charge, I proceeded to measure out my own “normal turkey load” of #5 lead shot. I then formed a half-sized ball of grass and tamped it firm over the shot column. Mark originally asked us to shoot at the patterning board from the 40 yard marker, but after explaining the cylinder-bored guns’ limitations, Tam and I took our places at 25 yards. She primed and fired at the right board, and I did the same on the left. I saw the main wad drop in the sand about ten feet in front of my board. Mark and the other writers got to the pattern boards before we did. Upon viewing the patterns, one writer expressed surprise at the apparent uniformity; another expected decent performance, noting today’s technology is based on yesterday’s practical experience. Mark Cargill started focusing his iPad on Tami’s pattern, and soon he and Tami were hovering over the screen in the shadows cast by an elevated platform. Early each June, the Michigan Outdoor Writers Association travels to a Michigan host city for the group’s summer conference. This year MOWA met in Gaylord. Treetops Resort, located east of town at 3962 Wilkinson Road, served as the hub for the weekend gathering. A “Welcome Reception” at the Gaylord Tourism Bureau on Friday evening got the weekend off to a great start with enjoyable networking and fellowship. At the end of the reception, Mark Cargill, a founding partner in Target Telemetrics LLC, gave a short presentation on the company’s newly developed “Automatic Shotgun Patterning” application written for Windows and Macintosh platforms. “Shotgun Profiler” is a similar application for the iPhone or iPad. Mark offered a free demonstration at the Northland Sportsmen’s Club of Gaylord, 1592 Old Alba Road, on Saturday afternoon. On Saturday, attendees scatter to the four winds partaking of a variety of outdoor adventures that make their way to print in the weeks that follow. Tami and I opted for a wilderness scout in the Pigeon River Country State Forest, a short drive northeast of Gaylord. We were looking for elk and deer. We didn’t seen any elk, but we had a wonderful time exploring the shores of the Pigeon River. At one point, I took off my moccasins and wool leggins and forded the cold-running river, just to say I had done it. Tam just laughed and shook her head. Late in the afternoon, we arrived at the Northland Sportsmen’s Club, still dressed in 18th-century attire. The well-groomed grounds offered little in the way of wadding material. As we walked to the pattern boards, I took a quick detour into the pines behind the parking lot and broke off two handfuls of narrow-bladed grass. I don’t think anyone saw me place it on the ground beside where we planned to load for the test; everyone was too busy studying our linen and wool outfits, which brings us to the beginning of this post. The application proved impressive, especially if you’ve ever counted pellets in a 30-inch circle. Tami grinned when she told Tom Lounsbury I had three bundles of rolled up pattern targets in the basement. She said I’d never throw them away, because I worked too hard counting holes. For Tami’s target, the iPad counted 92 death bees, 69 within the 30-inch circle. I thought she was using a 7/8 ounce load, which would be 148 pellets for a pattern percentage of 46.6 percent. Tami got to thinking about that number and decided to count out her pellets. After checking, she realized she used the wrong measurement and only loaded 130 pellets, for a corrected pattern percentage of 53 percent. Not bad for the Silver Cross’ cylinder-bored barrel. Old Turkey Feathers showed slightly better results with the grass wadding. In either case the supposed turkey died a humane death, which is the whole reason we go to the trouble of patterning our firelocks. But the big thumbs up from the afternoon was not confirmation that the guns produced good patterns, but rather the resulting questions and the opportunity to promote traditional black powder hunting and the versatility of 18th-century smoothbores. 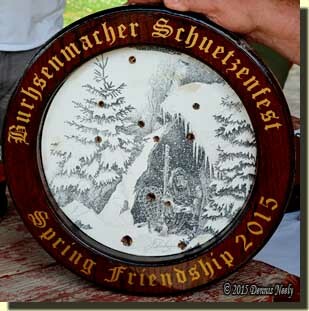 The following weekend I traveled to Friendship, Indiana, and camped on the home grounds of the National Muzzle Loading Rifle Association for the Spring National Shoot. On Sunday afternoon, folks congregate at the chunk gun range for the Gunmaker’s Match. A “competitor,” and I use that word loosely because this event is all about having fun, must shoot a gun of his or her own manufacture, thus the name Gunmaker’s Match. The “winner” from the previous year makes two identical targets, usually 14 to 16 inches in diameter, with artwork of his or her choosing. One target is shot at and the other acts as the trophy for the match. The maker designates the “bulls-eye,” some artistic element on the target, usually off to one side. Cloaked in secrecy, in a dark corner of Gunmaker’s Hall, a non-competitor rotates the target to his or her liking, covers the front with one-inch grid paper and screws on a backer board. At the end of a relay when the line is safe, the backer board and target are carried downrange an “undisclosed distance” and set firm. Makers pay three dollars for one shot, and if they miss the target, they have to pay another dollar. All of the money goes to support Gunmaker’s Hall. Once loaded, a shooter is called to the line while onlookers hoot and holler all manner of distractions. I loaded in the first platoon. I had a neat pile of grass on the loading bench that brought a few surprised stares as I rolled it into a ball. One gentleman asked what I was doing, while another builder who knows me said “Denny always loads his smoothbore with leaves and grass.” That comment raised several eyebrows. I felt a sudden urgency to hold up my end. The target was closer this year, not 130 yards out like in the past. Gerry Rubbo’s shot hit an inch to the right of dead center—a safe location given that the bulls-eye is rarely there. She smiled when she walked back to the bench—she knew she was safe, too. I was so intense on hitting the target that I did not follow through with my shooting plan. Knowing the grass-wadded ball would drop about five inches over the estimated distance, I planned to sight four inches above dead center. I primed and eased Old Turkey Feathers to my shoulder, but the turtle sight grabbed Gerry’s mark like it obsesses with a wild turkey’s eye at the moment of truth. At the end of the match, the target sported 13 hits. Justin Vititoe’s round ball struck closest to the trappers cap. It was Justin’s first time entering in the match. He was pestered into plunking down his three dollars, and his benefactor “overlooked” explaining the rules. 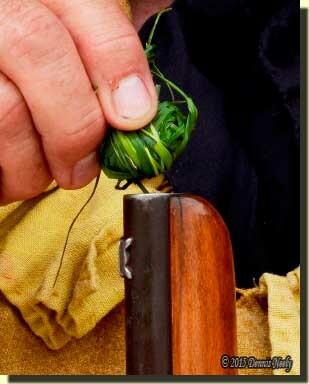 This entry was posted in Muzzleloaders, Wilderness Classroom and tagged Black powder hunting, Dennis Neely, historical trekking, Mountain Man, Native captive, North West trade gun, Northwest trade gun, trade gun, traditional black powder, traditional black powder hunting, traditional blackpowder, traditional blackpowder hunting, Traditional Woodsman. Bookmark the permalink.